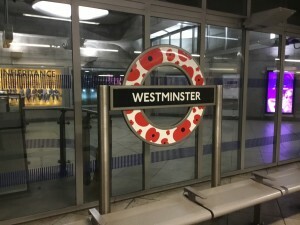 Westminster Station sign, London Underground, England. There are many ways for us to remember those who served. Equally there are many forms of reminders (poppies)…the obvious, which sometimes gather much attention, the hidden gems tucked away until we happen upon them and the November passers-by moving about their businesses with familiar red petals upon their lapels. 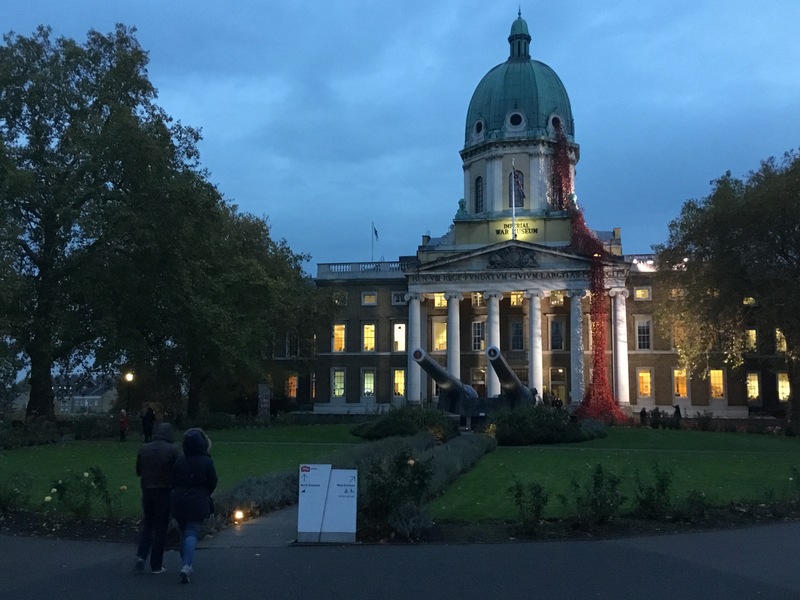 London’s Imperial War Museum featuring the ceramic poppy exhibition, Weeping Wibndow. Poppies, at this time, take on many forms…they are added to familiar logos, worn as jewels, pendants, pins and bracelets. They are paper, they are plastic. Crafted by hand with knitted fabric or as ceramic homage, all capture for a nation, Dad, Mom, Grannie, Grampa, ancestor, son, daughter, my family, our families who served. Poppies on our collars and lapels. Pinned to our jackets and caps. Placed upon the sacred and hallowed when released from our hand to a wreath, to a place or to an unknown soldier’s grave. 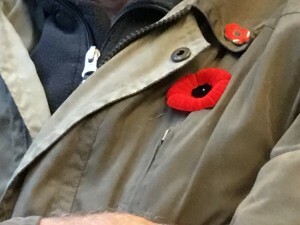 Poppies on our lapels and collars this year…this day. Do you rescue the ones fallen, from your collars, blowing in the wind? Do you make them whole again? Do you find a chosen place for them to bloom again this day? How do you remember? Who will you remember…this year…this day soon to come? This entry was posted by pferguson on Wednesday, November 7th, 2018 at 1:05 am	and is filed under Remember Them Well. You can follow any responses to this entry through the RSS 2.0 feed. You can leave a response, or trackback from your own site. 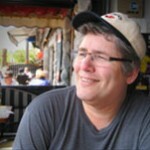 Paul has worked with the Paradigm Motion Picture Company since 2009 as producer, historian and research specialist. Paul first met Casey and Ian WIlliams of Paradigm in April 2007 at Ieper (Ypres), Belgium when ceremonies were being held for the re-dedication of the Vimy Memorial, France. Paul's sensitivity to film was developed at an early age seeing his first films at RCAF Zweibrucken, Germany and in Sardinia. Paul returned to Canada in 1967 and was further amazed by David Lean's "Lawrence of Arabia" and "Bridge on the River Kwai". Film captivated Paul and with time he became increasingly interested in storytelling, content development, character, direction, cinematography and soundtracks. At the University of Victoria, Paul studied and compared Japanese and Australian film and became interested in Australian film maker Peter Weir and his film "Gallipoli" (1981). Paul was entranced when he learned Weir had visited the beaches, ridges and ravines of the peninsula. 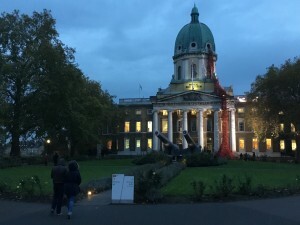 The film "Gallipoli" alone led Paul on many journeys to sites of conflict in England, France, Belgium, Holland, Germany, Malta, Hawaii and Gallipoli. It was, however, when Paul watched documentary filmmaker Ken Burns, "The Civil War", that Paul understood how his own experience and insight could be effective and perhaps influential in film-making. Combining his knowledge of Museums and Archives, exhibitions and idea strategies with his film interests would be a natural progression. Paul thinks like a film-maker. His passion for history and storytelling brings to Paradigm an eye (and ear) to the keen and sensitive interests of; content development, the understanding of successful and relational use of collections, imagery and voice. Like Paul's favorite actor, Peter O'Toole, he believes in the adage “To deepen not broaden.” While on this path Paul always remembers his grandmother whose father did not return from the Great War and how his loss shaped her life and how her experience continues to guide him.